Whether purchasing or picking zucchini -- choose firm, slender zucchini with a bright green color and free of wrinkled skin and soft spots. For best quality, harvest zucchini when it is young and tender, about 6 to 8 inches long and about 2 inches in diameter. As zucchini gets longer and bigger around, it becomes tougher and develops more seeds. These larger zucchini can be used to make zucchini bread; scoop out seeds and pulp with the tip of a spoon. Store unwashed zucchini in perforated plastic bags in the crisper drawer of the refrigerator; wash zucchini just before preparation. "You can either purchase perforated plastic bags or make small holes with a sharp object in unperforated plastic bags (about 20 holes per medium-size bag)," according to the University of Minnesota Extension. For best quality, use zucchini within about three to four days. Wash the squash just before preparation. 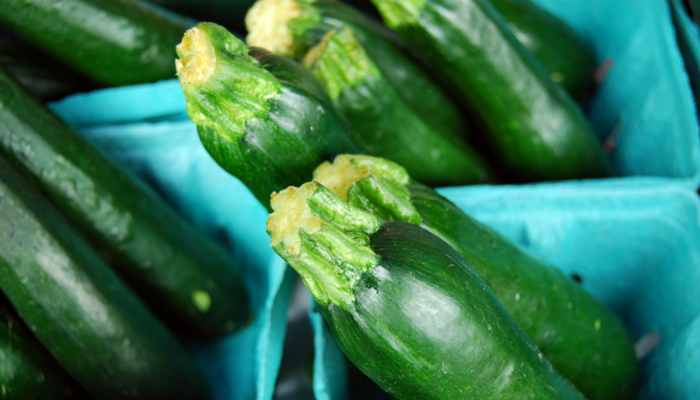 Zucchini makes a quick addition to meals as it doesn't have to be peeled! Slice, marinate (try balsamic vinegar) and grill a variety of vegetables including zucchini, asparagus, green onions, eggplant, and mushrooms. They're delicious! Cut up veggies like carrots, zucchini and potatoes. Add them to your favorite meatloaf or soup recipes. Take your favorite lasagna recipe and try adding different combinations of your favorite vegetables between the layers: mushrooms, spinach, broccoli, carrots, zucchini, onions, or eggplant. Be creative. Add raw zucchini to lettuce and pasta salads. Cut zucchini into sticks and serve with a dip. Slice zucchini, saute in oil over medium heat for about 5 minutes until tender crisp; toss into heated pasta sauce for a veggie-packed pasta topping. To freeze grated zucchini for baking, the National Center for Home Food Preservation recommends: Choose young tender zucchini. Wash and grate. Steam blanch (directions below) in small quantities 1 to 2 minutes until translucent. Pack in measured amounts into containers, leaving 1/2-inch headspace. Cool by placing the containers in cold water. Seal and freeze. 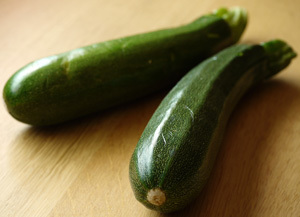 If watery when thawed, discard the liquid before using the zucchini. To steam blanch: Use a pot with a tight lid and a basket that holds the food at least three inches above the bottom of the pot. Put an inch or two of water in the pot and bring the water to a boil. Put the vegetables in the basket in a single layer so that steam reaches all parts quickly. Cover the pot and keep heat high. Start counting steaming time as soon as the lid is on. *Alice's notes: If you don't have whipped light butter, substitute a teaspoon of vegetable oil. Wash vegetables. Chop zucchini; slice carrots into thin slices; dice onions. Mix macaroni, tuna, and vegetables together in mixing bowl. Stir in salad dressing. Alice's Notes: Drain and rinse the pasta under cold, running water until cool. To allow flavors to blend, chill the salad for about a half hour to an hour before serving. In medium non-stick skillet, heat olive oil over medium heat. Add yellow pepper and rosemary and saute 2 minutes. Add zucchini and salt and pepper, to taste. Continue to saute for another 4 to 5 minutes or until zucchini is just tender. Remove from heat and stir in lemon juice. Nutritional Information: Per serving: 46 calories, 3 g total fat (<1 g saturated fat), 4 g carbohydrate, 1 g protein, 1 g dietary fiber, 6 mg sodium. (Source: Kaiti Roeder, RD, Nebraska Beef Council and Cattlemen's Beef Board and National Cattlemen's Beef Association - Beef, It's What's for Dinner. For more recipes made with zucchini, enter the word "zucchini" in the Nebr. Beef Council's recipe search feature and at www.beefitswhatsfordinner.com). Brown ground beef in large nonstick skillet over medium heat 8 to 10 minutes or until beef is not pink, breaking up into 3/4-inch crumbles. Remove from skillet with slotted spoon; set aside. Pour off drippings. Combine broth, tomatoes and pasta in same skillet, pushing pasta into liquid; bring to a boil. Reduce heat to medium; simmer, uncovered, 15 minutes, stirring frequently. Stir in zucchini; continue cooking 5 minutes or until pasta is tender. Return beef to skillet. Stir in 1/2 cup of the cheese; heat through. Sprinkle with remaining 1/4 cup cheese before serving.